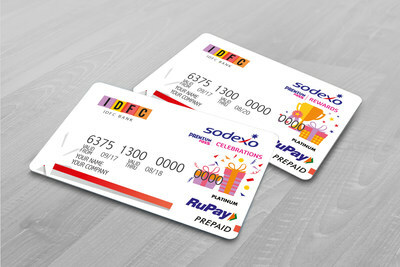 Sodexo, the leader in employee motivation and benefit services in India, announced the launch of Sodexo Premium Pass, a digital employee gifting solution, in partnership with IDFC bank and National Payments Corporation of India's (NPCI) RuPay. The launch is a significant step in Sodexo's digital journey in India. The gifting solution has two variants - the 'Premium Pass - Celebrations' for gifting during festivals and special occasions, and 'Premium Pass - Rewards' for ongoing employee and channel reward, and recognition programs. The cards will be accepted at over two million retail outlets and across all major online portals on the RuPay network. Sodexo's three million daily consumers across 11,000+ clients will now get access to this new offering. Stephane Michelin, CEO, Sodexo BRS India said, "Sodexo is committed to address the needs of its clients, which makes the company introduce new and innovative solutions to better address the increased sophistication of the Indian HR and incentive practices. Premium Pass is a 'personalized' gifting solution and also gives the employees of our clients, access to exciting value deals and discounts from leading brands, exclusive for Sodexo cardholders. This increases the purchasing power of their employees far beyond the actual value of the gift. We are delighted to partner with IDFC Bank and RuPay to present this unique offering to our clients and look forward to creating an unparalleled experience for our consumers through new age technologies in the benefits and rewards space." Avtar Monga, Executive Director, IDFC Bank, said, "The launch marks IDFC Bank's foray into the prepaid card space, with solutions that are convenient, secure and transformational. Gift cards work as digital incentives for corporates and merchants, and are an alternative to traditional gifting. When these cards are made reloadable, and coupled with savings and credit-building capabilities, they serve as a bridge to the financial mainstream. Our partnership with Sodexo will take customer experience in the digital prepaid segment to the next level. It will also enable the bank to address a diverse set of customers, who could potentially upgrade to a longer-term financial services relationship." Mr. Dilip Asbe, Chief Operating Officer, National Payments Corporation of India said, "We welcome the valued customers of Sodexo and IDFC Bank to RuPay's robust acceptance network. We believe market potential for prepaid cards are huge and this strategic partnership is aligned to tap the niche segment." Both variants of the Sodexo Premium Pass are personalized and secure PIN-based cards. They can also be linked to the mobile app for easy transactions on the go. The consumers will be eligible for tax savings on up to Rs. 5,000 per year on these cards. Sodexo's clients will have the benefit of ordering and loading these cards from a simple, user-friendly interface that they already use for the meal benefit solution. This offering is poised to usher in a new era in festival gifting, rewards & recognition in India. The Sodexo group works towards improving the quality of daily life for clients, consumers and merchants across the world. Sodexo BRS, India's No.1 Employee Motivation & Benefits Services provider is a partner to over 11,000 HR Leaders since 20 years. Our Employee Benefit Solutions are customized to meet specific needs of organizations and help them develop their best motivated workforce. Sodexo BRS offers a range of employee benefit solutions, which include Meal Pass, Cafeteria Pass and Premium Pass. Sodexo reaches out to over 3 million beneficiaries across 1,500+ cities servicing through over 45,000 touch points. To know more, please visit: www.sodexobenefits.in or Twitter, Facebook and LinkedIn. National Payments Corporation of India (NPCI) was set up in 2009 as the central infrastructure for various retail payment systems in India and was envisaged by the Reserve Bank of India (RBI) as the payment utility for all banks in the country. From a single service of switching of interbank ATM transactions through National Financial Service, the range of services has grown to Cheque Truncation System, National Automated Clearing House (NACH), Aadhaar Enabled Payment System (AePS), USSD based *99#, RuPay card, Immediate Payment Service (IMPS), Unified Payments Interface (UPI), Bharat Interface for Money (BHIM), BHIM Aadhaar, National Electronic Toll Collection (NETC) and Bharat Bill Payment System (BBPS). To know more, please visit: Facebook: NPCI and RuPay or Twitter: NPCI and RuPay. IDFC Bank (BSE: 539437, NSE: IDFCBANK) is a subsidiary of IDFC Ltd (BSE: 532659, NSE: IDFC). Headquartered in Mumbai, IDFC Bank is a universal bank, offering financial solutions through its nationwide branches, internet and mobile. Envisioned as a new age bank, IDFC Bank seeks to set a new standard in customer experience, using technology and a service-oriented approach, to make banking simple and accessible, anytime and from anywhere. In keeping with IDFC's legacy of building the nation, IDFC Bank will focus on serving the rural underserved communities and the self-employed, while continuing to support the country's infrastructure sector. IDFC Bank provides customized financial solutions to corporates, individuals, small and microenterprises, entrepreneurs, financial institutions and the government. With best-in-class corporate governance, rigorous risk management, experienced management and a diversified team, IDFC Bank is uniquely positioned to meet the aspirations of its customers and stakeholders. http://www.idfcbank.com or Twitter, Facebook and LinkedIn.